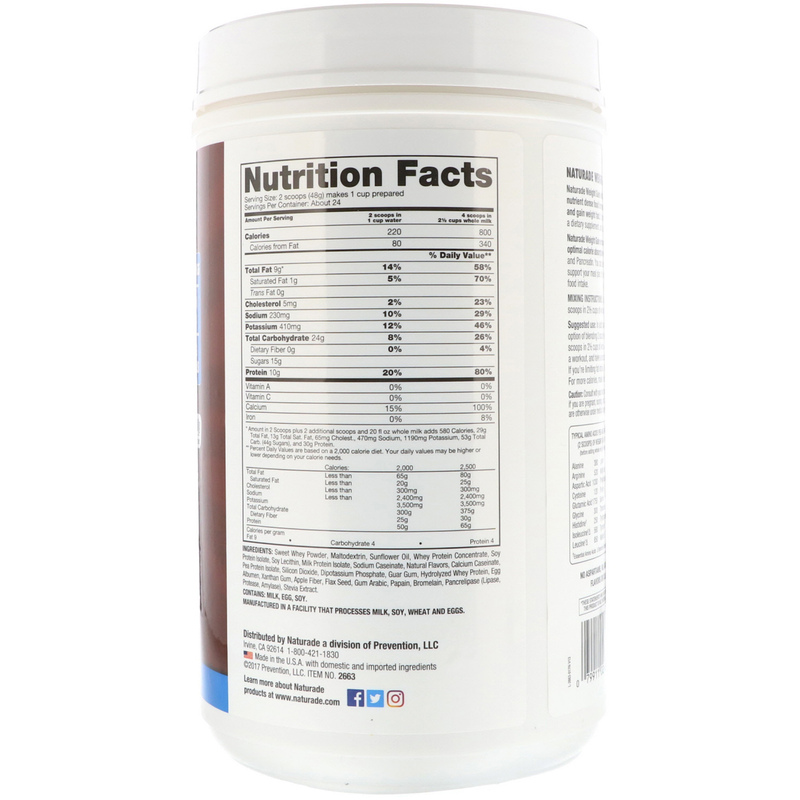 Naturade Weight Gain enhances your body's utilization of nutrients for optimal calorie absorption with 3 natural enzymes - Papain, Bromelain, and Pancreatin. You can add over 1600 calories daily in a fast, safe way to support your meal plan. It's important that you do not reduce your regular food intake. Mixing Instructions: Stir or blend 2 scoops in 1 cup of liquid or 4 scoops in 2 ½ cups of whole milk. In addition to balanced daily nutrition, you have the option of blending 2 scoops in 1 cup water, or to maximize calories, 4 scoops in 2½ cups of whole milk. Drink before noon, preferably before a workout, and have a second shake about 1 hour before you go to bed. 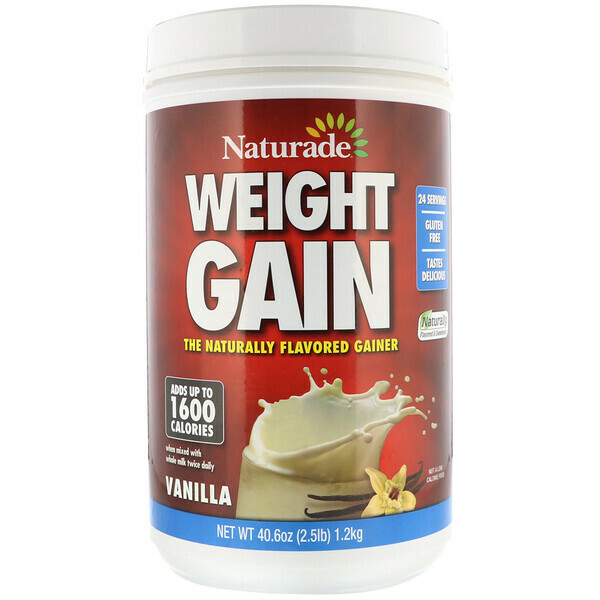 If you're limiting fat intake, Naturade Weight Gain tastes great in water. For more calories, makes delicious smoothies with yogurt and/or fruit. Sweet whey powder, maltodextrin, sunflower oil, whey protein concentrate, soy protein isolate, soy lecithin, milk protein isolate, sodium caseinate, natural flavors, calcium caseinate, pea protein isolate, silicon dioxide, dipotassium phosphate, guar gum, hydrolyzed whey protein, egg albumen, xanthan gum, apple fiber, flax seed, gum arabic, papain, bromelain, pancrelipase (lipase, protease, amylase), stevia extract. No aspartame, no added sugar; no artificial sweeteners, flavors, or colors, no preservatives, no MSG. Caution: Consult with your healthcare practitioner before using this product, especially if you are pregnant, nursing, anticipate surgery, take medication on a regular basis or are otherwise under medical supervision.